This is Part 2 of a two part series on ecological resilience in prairies. In Part 1, I interviewed Dr. Craig Allen about the basic definition of ecological resilience and then wrote about the relevance and application or resilience to prairie ecosystems. In Part 2, I explore how ecological resilience can influence the way we restore and manage prairies, and about how much we still have to learn about how to do that. Understanding ecological resilience should help us better design restoration and management strategies that build and maintain resilience in prairies. Using the components of resilience discussed in Part 1, it seems apparent that when restoring (reconstructing) prairies, it’s important to maximize species diversity in seed mixtures. More importantly, prairie restoration that adds to the size and connectivity of existing prairie remnants should make the entire complex of restored/remnant prairie more resilient (see earlier post on this subject). Finally, selecting and altering restoration sites, when possible, to include topographic and other habitat type variation – and multiple examples of each type – can also help ensure the resilience of the resulting restored prairie. Designing management strategies for prairies that sustains ecological resilience is trickier because we still have much to learn. We’re far from fully understanding the various stable states prairies may exist in, or flip to, let alone where the thresholds are between those states. In addition, the level of plasticity, or range of adaptive capacity, of prairies is a subject of great debate right now among prairie ecologists – although the discussion is not usually framed in those terms. The real question is – How much can prairies change their plant and animal species composition and still remain “in the bowl”? As an example, I manage a sand prairie that was hayed annually in the mid-summer for about 20 years before The Nature Conservancy purchased it in 2000. Over that 20 year period, the plant community in that prairie adjusted to that annual haying regime. Species such as stiff sunflower, leadplant, and sand cherry became restricted to a few steep slopes where hay equipment couldn’t go. Early summer grass and forb species became very abundant, but later season flowering plants were less so because they were mowed off around their flowering time each year. The prairie was a nice quality mixed-grass prairie, with good plant diversity, but definitely had the “look” of an annually-hayed prairie. Stiff sunflower has increased in abundance since annual haying ceased. When we took over the management in 2000, we let the site rest for about 5 years and burned portions of it each year during that time. Then, we began introducing some combined fire and grazing treatments at different intensities and at varying times of the season. As a result, the prairie looks fairly different now. Stiff sunflower and leadplant have spread considerably through the site, re-taking lower slopes where hay equipment had earlier eliminated them. Cool-season grasses (native and non-native) change in abundance from year to year, but warm-season native grasses are certainly more dominant than they previously were. Overall forb diversity is about the same as it was, but the relative abundance of many forbs has changed, and those abundances now vary from year to year, rather than remaining fairly stable. In the context of plasticity, or adaptive capacity, this prairie has demonstrated that the 20 years of haying was not enough to move the plant community into a new stable state from which recovery, if that’s the right word, was not possible. The community was altered by that haying regime, but upon alteration of that regime, the community composition morphed to match changing conditions – without losing plant diversity. In other words, assuming that the prairie hasn’t lost anything critical during the 11 years of our management, both the haying regime and our current management have kept the prairie “in the bowl”, though it changed appearance fairly dramatically. Its adaptive capacity is broad enough to include the “hayed” look and the “crazy Nature Conservancy management” look. The real test of this, of course, would be to reintroduce haying for another 20 years and see if the plant community reverted back to something very similar to the condition it was in when we purchased it. This sand prairie has changed species composition substantially since we switched management from annual haying to a mixture of prescribed fire and grazing. Here’s another example from my own experience. We have a 45 acre restored prairie (prairie reconstruction) that was seeded in 1995 by Prairie Plains Resource Institute adjacent to a degraded remnant prairie. The seed mixture included approximately 150 species of mesic prairie plants, most of which established successfully. We managed the prairie with periodic spring fire for its first seven years, and then incorporated it into our experimental patch-burn grazing system (light stocking rate). During nine years of patch-burn grazing management, (6 of which were during a severe drought) the plant species composition in any one place has bounced around quite a bit due to the fire/intense grazing/rest cycles imposed by the patch-burn grazing management system. Overall, however, the prairie has maintained its mean floristic quality within 95% statistical confidence intervals (I collect annual data which entails calculating floristic quality within 100 1m2 plots and averaging the values across those plots). Read more about our patch-burn grazing work and results at this restored prairie and others here. That’s not to say the prairie hasn’t changed – it has. Some plant species have increased in frequency among my annual data collection plots, some vary in frequency from year to year, and others stay fairly stable. However, no species has dramatically declined over the time period. (I wish I had data on other species, particularly insects, but I don’t.) Perhaps the most interesting, and somewhat concerning, phenomenon has been an increase in the frequency of Kentucky bluegrass in my plot data. The increase has been fairly steady over the nine years of patch-burn grazing and data collection, and bluegrass is now in about 75% of my 100 1m2 plots, though it rarely looks dominant where it occurs. To this point, that increasing frequency doesn’t seem to be impacting the overall diversity or floristic quality of the plant community, but that doesn’t mean it won’t at some point. Two possibilities are: 1) Our management is allowing bluegrass to enter the plant community but remain a minor component, or 2) Kentucky bluegrass is on a steady march of increasing dominance and will eventually turn my restored prairie into the same kind of low-diversity degraded prairie that exists in the adjacent remnant prairie. I won’t be completely shocked by either scenario, but I have hope that #2 won’t happen because of the way bluegrass is acting in the community to this point. It’s way too early to know for sure. Interestingly, I have some large exclosures within this restored prairie that have never had grazing, only prescribed fire at a similar frequency to the grazed portion. Those exclosures have very little Kentucky bluegrass in them – probably because of both the differing management and the fact that the exclosures are on the far side of the restoration from the neighboring bluegrass-dominated remnant prairie. However, the exclosures also have much lower plant diversity and mean floristic quality than the grazed portion of the restored prairie. 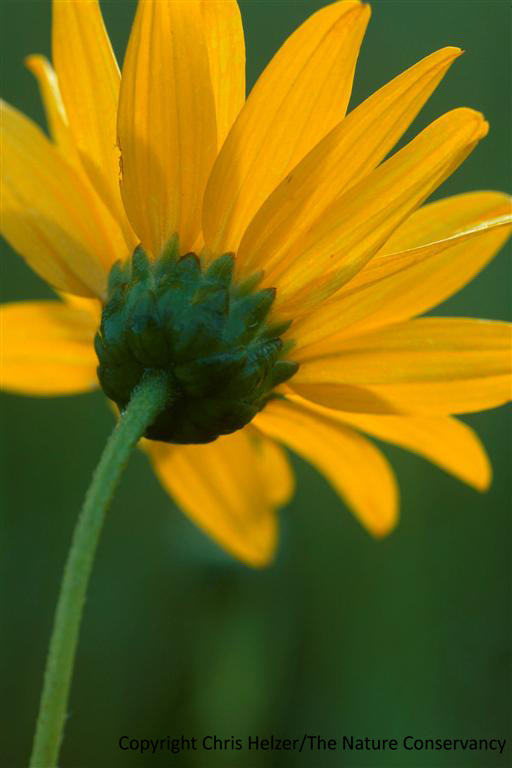 Visually, they are dominated by warm-season grasses and a few large forbs (e.g., perennial sunflowers). At this point, I prefer the grazed portion of the prairie because it seems to line up better with my management objectives of maintaining diverse and resilient plant communities (assuming it’s not slowly becoming a bluegrass wasteland). This photo was taken when the 1995 prairie seeding was nearing the end of its establishment period (fifth growing season). The prairie has maintained its mean floristic quality (and all of its plant species) through years of patch-burn grazing and drought. To relate this example back to adaptive capacity, it appears likely that the grazed portion of the restored prairie has the adaptive capacity to retain its integrity as a prairie community through fairly wild fluctuations in species composition as a result of stresses from fire, grazing, and drought. This is, again, remembering that I’m only evaluating the plant community and that the experiment is far from over. On the other hand, it appears the exclosed portions of the prairie have lost plant diversity over time. Whether the communities in those exclosures are still “in the bowl” or in a new stable state of lower diversity is a big question. To address it, I’m going to open one of them to fire/grazing this coming year and exclude a portion of the currently-grazed prairie and see what happens. If the two plant communities trade identities to match their new management regimes, I’ll know that both were still “in the bowl” and understand more about the adaptive capacity of our prairies. If they don’t, that will be equally instructive! Building and sustaining ecological resilience in prairies may be the most important component of prairie conservation in the coming decades. Threats from invasive species, habitat fragmentation and detrimental land management practices, compounded by climate change, will make conservation extremely difficult. Armoring prairies with ecological resilience gives us the best chance of success. What is the adaptive capacity of prairies, and where are the thresholds between the desired state and other, less desired, stable states? This will certainly vary between tallgrass and mixed-grass prairies, and between sand prairies and black soil prairies, etc., but there will almost surely be some consistent themes. How important is it to keep the ball moving within the bowl? In other words, are prairies really like our human bodies, in that the more we stress and rest them, the better prepared they are for future stresses? (Does the bowl shrink if we don’t keep pushing at the edges?) Or do we just have to keep prairies from being stressed too far in any particular direction? We can work toward answering these questions with direct experimentation on prairies we manage (similar to my simple experiment with grazing and exclosures in the restored prairie example presented earlier). In addition, though, we can learn much from prairies that “flip” to less desirable stable states (hopefully not the ones we’re managing!) by documenting as much as we can about what happens to them and why. Most importantly, I hope that thinking about ecological resilience with regard to prairies will make you look at the prairies you’re familiar with in a new way. Seeing prairies as balls rolling around in a bowl makes watching and managing prairies a much different experience than seeing them as a stable “climax community.” When we expect change, it’s easier for us to perceive change, and the more observant we are, the more we’ll learn. And goodness knows we have plenty to learn. If you’re interested in learning more about ecological resilience, here are some relevant references that Craig Allen recommends (I’m pretty sure it’s just a coincidence that he’s a co-author on all of them). The Gunderson et al. book reprints a lot of the classic / foundational papers on the subject. Sundstrom, S., C. R. Allen and C. Barichievy. Biodiversity, resilience, and tipping points in ecosystems. Conservation Biology: in review. Gunderson, L., C. R. Allen, and C. S. Holling. 2010. Foundations of Ecological Resilience. Island Press, New York, NY. 466pp. Forys, E. A., and C. R. Allen. 2002. Functional group change within and across scales following invasions and extinctions in the Everglades ecosystem. Ecosystems 5:339-347. Peterson, G., C. R. Allen, and C. S. Holling. 1998. Ecological resilience, biodiversity and scale. Ecosystems 1:6-18. This is Part 1 of a two part series on ecological resilience in prairies. Part 1 starts with an interview with Dr. Craig Allen, the Unit Leader of the Nebraska Cooperative Fish and Wildlife Research Unit at the University of Nebraska-Lincoln. Craig has studied and written extensively about ecological resilience and I’ve been fortunate to collaborate with him on several research projects examining the role of resilience in grasslands. Following the interview with Craig, I present some of my own thoughts about how to apply the idea of ecological resilience to prairies. Part 2 builds upon that theme, exploring the relationship between resilience and prairie restoration and management. I’ve had a hard time finding much written about ecological resilience and prairies – at least not much that can be easily and directly applied to prairie conservation. This is my attempt to begin a conversation on that subject. Please chime in with your own thoughts and opinions. Prairie Ecologist: Why don’t you start by describing “ecological” resilience? Allen: The term resilience has a long history, and has been used in academic fields such as psychology, medicine and engineering. In psychology and engineering, the term usually refers to the return time to a state of equilibrium following disturbance. The term “ecological resilience” was forwarded in 1973 by C.S. Holling. The definition was different than earlier definitions. Ecological resilience followed from an emerging understanding of multiple stable states. When a system can occur in more than one state – for example, grasslands can remain grasslands or transition to forest – resilience is a measure of the amount of disturbance required to cause that state change. A system with low resilience can “flip” into an alternative regime very easily, but very resilient systems can be highly variable while remaining in the same regime. Resilience is not necessarily a good thing – – degraded systems (like eutrophic lakes) can be very resilient – difficult to change. Click here to see a graphic illustration of ecological resilience. Prairie Ecologist: So, the range of stability quantifies the ability of an ecological system to stay within one stable state. What influences that range of stability in grasslands? Allen: First, it’s important to understand that stability in this context means the ability to stay within a regime (rather than to remain “unchanging”). In fact, highly variable systems are often more resilient, and thus the term stability is a term to be used cautiously because no ecological systems are strictly “stable”. We think resilience is influenced by the distribution of functions, functional diversity and response diversity. A diversity of functions means that the system can cope with a wide range of perturbations. Think of function as the way an animal or plant species exploits its environment. For example, an annual nitrogen-fixing plant will respond to drought differently than a perennial. In addition, two members of the same functional group (e.g. annual nitrogen-fixing plants) may respond differently to a perturbation, so species that have been uncommon in a community may change roles and become common (or “drivers”) under some situations. In this way, resilience has a lot to do with plasticity, not just at the species level, but within communities. An ecological community with a high number of species is generally better able to adapt to changing conditions (without “flipping” to another regime) than a similar community with fewer species because of the range of functions those species are capable of performing and the high degree of redundancy and response diversity. Prairie Ecologist: What else would you want ecologists and prairie enthusiasts to know about ecological resilience and how it should influence their thinking and strategies in prairies and prairie landscapes? Resilience is quite different from stability, and quite different from efficiency. In fact, very efficient systems are often not very resilient at all. When we alter or manage ecological systems to try to optimize a single output (e.g., corn, annual hay, or mid-summer flowers) we are increasing efficiency but decreasing resilience. Resilience is about getting an “output” across a wide variety of conditions, while optimization and efficiency seek to maximize a narrow range of outputs. Tallgrass prairie at Camp Cornhusker (Boy Scouts of America) near Humboldt, Nebraska. What role does ecological resilience play in the future of prairies? What makes a prairie resilient? We need to understand the components of ecological resilience in prairie ecosystems before we can design effective restoration and management strategies. Unfortunately, as Craig has told me, much of what we think about ecological resilience is still theoretical, and we are greatly in need of more experimental studies. Keep that in mind as you read this, and maybe you can help refine some of these ideas based on your own experiences or through future observations/research. Don’t take my thoughts to be the truth. I’m trying to lay out the way I understand the ecological resilience of prairies based on my own experiences and those of others I know, but there’s an awful lot I (and others) don’t understand yet. As always, your comments and thoughts are very welcome. Clearly, species diversity plays a role in ecological diversity, and it can be one important indicator of the resilience of a prairie. However, Craig stresses that comparisons of diversity/resilience should only be made within the same ecological systems. In other words, just because a tallgrass prairie has higher species diversity doesn’t mean that it’s more resilient than a shortgrass prairie that has fewer species. However, between two tallgrass prairies where latitude, soil type, and other factors are similar, the one with higher species diversity is likely more ecologically resilient. Why? As Craig talked about in my interview with him, species have different ways of interacting with their environments – even species that we categorize together (e.g., annual legumes, perennial cool-season grasses, herbivorous ground beetles, etc). When something stresses a prairie – such as drought, intensive grazing, or a pest outbreak – some species will be better suited to respond to that stress than others. The prairie community’s “response” to the stress is that those species better suited to deal with the stress will become more abundant as other species become less abundant. In a resilient prairie community, the species that increase in abundance will fill at least somewhat similar roles to those that decreased in abundance so that the overall ecological processes in the prairie continue on as before. Moreover, when a stress in the other direction (e.g., a wet period that follows a drought) occurs in that same resilient prairie, the previously abundant species will regain their dominance under the conditions they are best suited for. In contrast, a less resilient prairie might experience a drastic shift in its ecological processes in reaction to the same stress, and might not recover its prior composition when conditions change back to what they were. By the way, I’m presenting these changes as linear – species composition changing in one way and then straight back to the previous condition again – because it makes for easier illustration. In reality, it’s better to envision a ball rolling around in a constantly moving bowl. As long as the bowl (the ecological community) remains in the bowl (the stable state) it can theoretically return to a previous point, but it’s unlikely to happen very often. However, if the ball leaves the bowl because something drastic happens to push it out, it’s very difficult – or impossible – for it to return to the same bowl again. Let’s look at a couple examples. When a prairie experiences drought conditions for a couple consecutive seasons, some plant species will become less abundant – or at least produce fewer flowers – while other species will respond in the opposite way. In order for pollinator insects to survive those drought years, the flowering species that respond positively to the drought conditions must provide the same kind of opportunities for those insects to get nectar and pollen as the plant species that are now much less abundant. If there are fewer overall blooms across the prairie, or the size/shape of flower that a particular pollinator needs is not available, pollinator species (and pollination services) will suffer. That loss of pollination can cascade through the prairie system, affecting seed production by plants, food availability for seed-eating insects and animals, and so on. 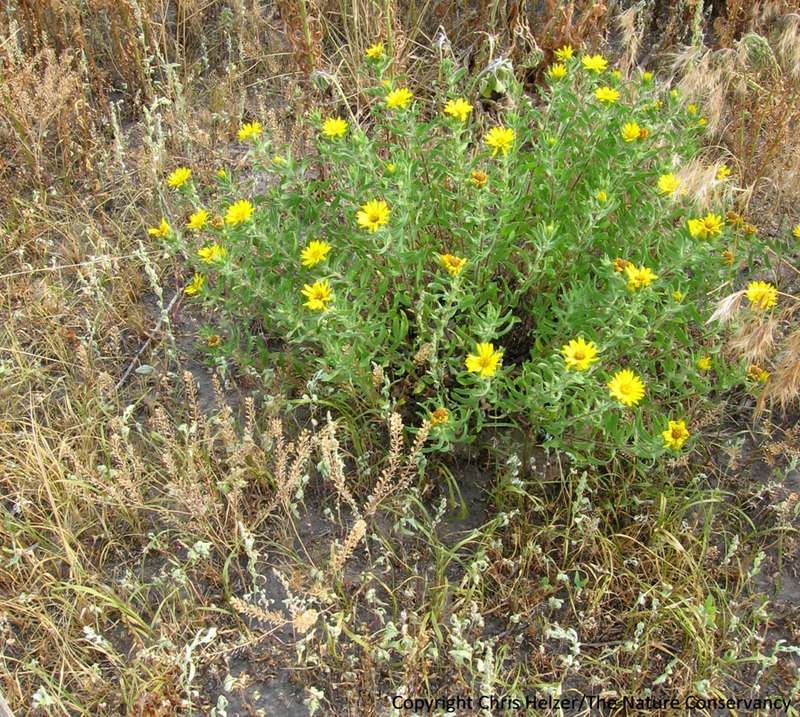 Plant species like hairy goldenaster can respond during drought years when other plant species suffer. Maintaining species like that can help a prairie’s resilience to drought. Herbivores have somewhat similar needs to pollinators. An insect that feeds on the leaves of warm-season grasses or the flowers of legumes needs suitable leaves or flowers to be available in dry years as well as wet. Prairies with higher species diversity are more likely to have the redundancy across those plant species categories and provide consistent food sources for those herbivores, regardless of climatic variations. Besides species diversity, there are other important components of ecological resilience in prairies. Among those, two interrelated examples are the size of a prairie and the redundancy of its habitat types. Prairie size has become more of an issue, of course, as many prairies have become fragmented by human development. Smaller prairies can hold fewer individual plants and animals than larger prairies, making species more vulnerable to local extinction. Isolation from other prairies makes the situation even worse, because it further increases the likelihood that species will disappear from a particular prairie (butterflies in two prairies close to each other can exchange individuals between sites, helping to compensate when numbers drop in one of the prairies). Equally important, once a species disappears from an isolated prairie, it’s unlikely to ever recolonize from other prairies. Small prairies not only have fewer individuals of each species, they tend to have fewer species overall. This phenomenon is laid out in MacArthur and Wilson’s Theory of Island Biogeography. Both the lower number of species and the vulnerability of those species to local extinction reduce the overall ecological resilience of small prairies for the reasons explained above. In addition to the size of a prairie, the number of habitat types it has influences its species diversity. A prairie that has wet, mesic, and dry habitats is likely to have more species than a prairie that has only one habitat type. Besides the total number of habitat types, the redundancy of those habitats within a prairie is important as well. Many species of plants and animals are tied to relatively specific habitat conditions (e.g. sub-irrigated meadows or south-facing dry slopes, etc.) so the boundaries of those habitat types are also the boundaries of populations of those species. In that way, those habitat types and populations function and interact much like small prairies (island biogeography again). 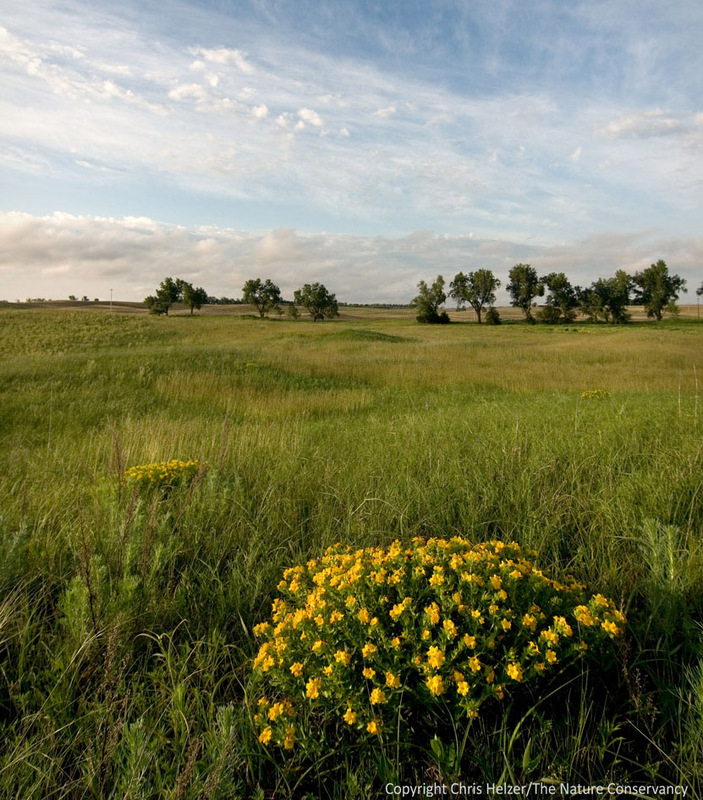 A prairie that has multiple examples of the same habitat type, especially if they’re close enough for species to interact between them, is more likely to sustain viable populations of the species that rely on those habitats than prairies that have fewer (or more disjunct) examples of each habitat type. Thus, prairies with multiple examples of habitat types are more resilient, in that they are less likely to suffer species extinctions. AND – since the number of habitat types is likely to be higher in large prairies than smaller prairies, we’re back to talking about prairie size again. Assuming that ecological resilience is relevant to prairies, it’s extremely important that we learn more about how to recognize the boundaries between current and potential stable states – and how to predict when those thresholds might be crossed. One fairly obvious example of multiple stable states relative to prairies involves eastern redcedar invasion. A prairie with a few scattered cedar trees is still a prairie, but at some point, the trees become dense enough that the prairie becomes a woodland. When the trees are small and scattered, fire can still push the prairie back to a less wooded state (the ball is still in the bowl), but at some point the trees become large enough that they are almost invulnerable to fire, and when the size and density of trees reach a certain point, there is not enough grass beneath them to carry a fire anyway. Once a prairie has converted to a cedar woodland, everything is different. The woodland obviously hosts a completely different set of species living in it now because most prairie plants, insects, and other animals can’t survive in the dense shade of the cedar trees. The soils begin to change too, because they are no longer being built and maintained by the annual growth and death of prairie plants – or by the countless species of tiny invertebrates, bacteria, and fungi that drove that process of decomposition. Both the plants and their decomposers are gone and are replaced by those species that can live under cedar trees. The seed bank in that soil changes too, because many prairie seeds have a relatively short life span in the soil. As a result, even if a massive tree clearing operation takes place and removes all of the cedar trees, there are a tremendous number of obstacles that can prevent the site from becoming a prairie anything like the one that previously existed. The ball is in a different bowl. 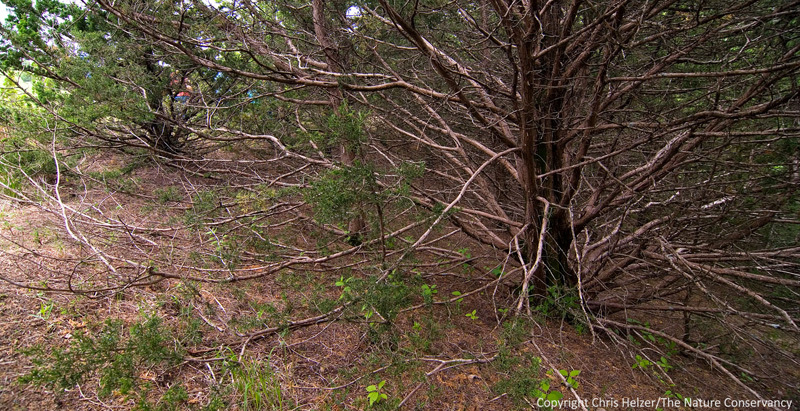 When eastern red cedar invasion reaches a certain extent, extensive changes occur, not only to plant species composition, but to ecological processes. 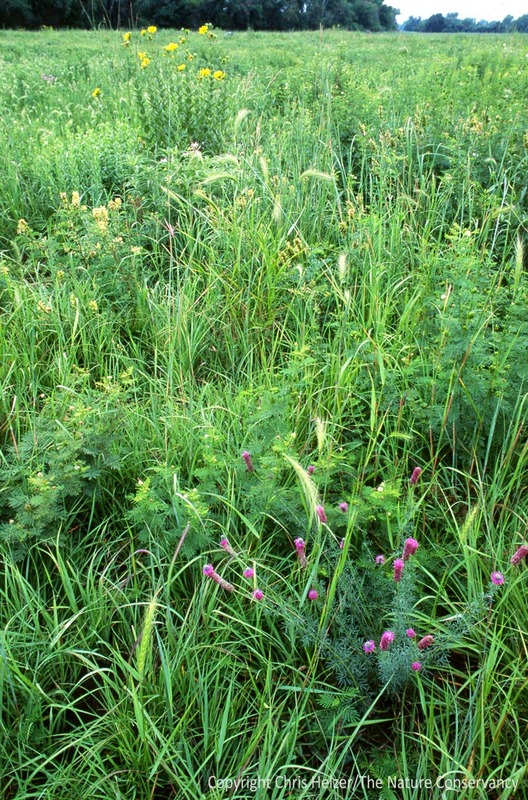 Another change of stable states seems to occur when a prairie plant community loses plant diversity and becomes increasingly dominated by invasive grass species. I’m not sure whether the loss of plant diversity allows the grasses to gain dominance or the grasses push the other plants out (chicken and egg?) but the phenomenon often occurs as a result of chronic overgrazing and/or broadcast herbicide application. Once grasses such as smooth brome, Kentucky bluegrass, or tall fescue become dominant, it appears to be nearly impossible to regain plant diversity in those prairies – the ball is in a different bowl again. As opposed to the cedar example, above, we don’t yet fully understand what makes it so difficult to reverse the loss of plant diversity in this example. Simply altering management doesn’t seem to have much impact (it’s possible to switch dominance from cool-season invasive grasses to warm-season native grasses, but forb diversity remains low). Clearly, forbs can’t regain dominance if they and their seeds are no longer present, but even when seed or seedlings are reintroduced, most people have experienced only moderate success – at best – in regaining some degree of plant diversity. It’s likely that important insect-plant host and soil microbe-plant host relationships have been broken and that those play a large role in holding back recovery. It’s also possible that soil nutrient levels have altered (e.g., more nitrogen) in ways that favor continuing invasive grass dominance. Whatever the reasons, it’s clear that avoiding crossing the threshold into the low diversity/invasive grass dominance state should be a high priority for prairie managers. This discussion is continued in Part 2 of this two-part blog post. That post focuses on applying ecological resilience as we restore and manage prairies.